Discussion in 'Coin Chat' started by kaparthy, Feb 3, 2019. During World War II, Canada included a patriotic message on its 5-cent coins: We win when we work willingly. The slogan was in Morse code, flush along the rim of the reverse. While not obvious, neither was it intended to be secret. Rather, the message was an element of the propaganda effort. Another wartime effort was Canada’s use of tombac, an 88-12 alloy of copper and zinc to replace nickel on the 5-cent coins of 1942 and 1943. In our time, the US “Native American” (Sacagawea) dollars for 2016 honor the Code Talkers. At first, during World War I, Native American soldiers worked as telephone operators because it was unlikely that Germans (who did know English) would know their languages. In addition, the Americans quickly adopted slang of their own to add a layer of obfuscation. World War II was a much larger and longer engagement. In 1943, the total population of the USA was 136.7 million, of whom 9.2 million were in the armed forces. Although American civilians who were ethnically Japanese were placed in concentration camps, their sons were allowed to join the armed forces (and fight in Europe). So, of course, the military tapped a new generation of Native American Code Talkers. (Shown here is the reverse (proof) and obverse (business strike) of the 2016 Code Talkers commemorative One Dollar "Native American" (Sacagawea) coin. Although the Navajo Code Talkers are the best known among them, as a result of books and a recent movie, in fact, they came from over 30 tribes and nations. For her work, the British Numismatic Society granted her a John Sanford Saltus Gold Medal in 1986, the only time that the medal was awarded to someone working exclusively with Scottish coins. Shown here are two coins from the Austin, Texas, chapter of OWASP (Open Web Application Security Project) conventions. The red one is from an annual "B-Sides" spring meeting and the blue is from an annual autumn LASCON (Lonestar Application Security Conference) meeting. The coins were awarded to those who cracked the codes and hidden messages on the convention name badges. TypeCoin971793, Rich Buck, G.C.B and 26 others like this. I read it as 'coeds'.........never mind. Evan8, kaparthy, eddiespin and 1 other person like this. I have some of those. Had them since the 40's or early 50's and never new that about the Morse Code. Thanks. See the US Mint sales pages for special medals and medallions here. Now this is coin collecting! Neither did I know this about these coins. Well done, Michael. LaCointessa, ldhair and green18 like this. 88% Copper - 12% Zinc is "tombac?" I think that alloy is also called "commercial bronze" is it not? 88% Copper - 12% Zinc is "tombac?" ... I think that alloy is also called "commercial bronze" is it not? Well... now I know. Tombac is one of the few Indonesian loan-words in English. It is 5% to 20% zinc or with other metals and mostly copper. Commercial copper is 90-10. Wikipedia knows. However, Tombac implies a zinc ratio that makes it a more accurate name for 88% Cu - 12%Zn. So thanks! I had no idea about the morse code. Thanks for the write up! How cool I actually have one of these Canadian coins. The 2014 movie The Imitation Game told the story of Alan Turing and his failed romance with Elisabeth Clarke. Of course several other modern coins have "codes" too. But those are not necessarily war or military related. paddyman98 and kaparthy like this. Which ones? I mean, really, even the communication we accept here as "plaintext" is really just a code. And we all know DEF FID IND IMP and all that... I certainly would like to know more about coins and codes. You will know the Italian 500 lire coin that has the value "500" in Braille at the top. Now whether that counts as a code, I don't know (and actually the dots on that coins were too small to be "readable" by blind people), but AFAIK it was the first coin with Braille. Germany usually uses mintmarks on the coins, but sometimes the government decides to not have them on this or that collector coin. However, they will need or want some means of differentiation, for QC purposes. So various "tricks" have been used, see here, comments 2, 3, 7 and 9. €10 2006 FIFA World Cup: The slogan ("DIE WELT ZU GAST BEI FREUNDEN") was used as the edge inscription; it contains five E's. Usually the three horizontal bars of that character have the same width or length. Now a middle bar of an E that is shorter than the top and bottom bar will indicate the mint: First "E" > Berlin, second "E" > Munich, etc. €10 2009 IAAF Athletics Championship: Here a morse code was added on the edge, with dots and dashes indicating the mint. 2010 Alpine World Ski Championship (in 2011): It gets even trickier, but you need a magnifying glass for this. 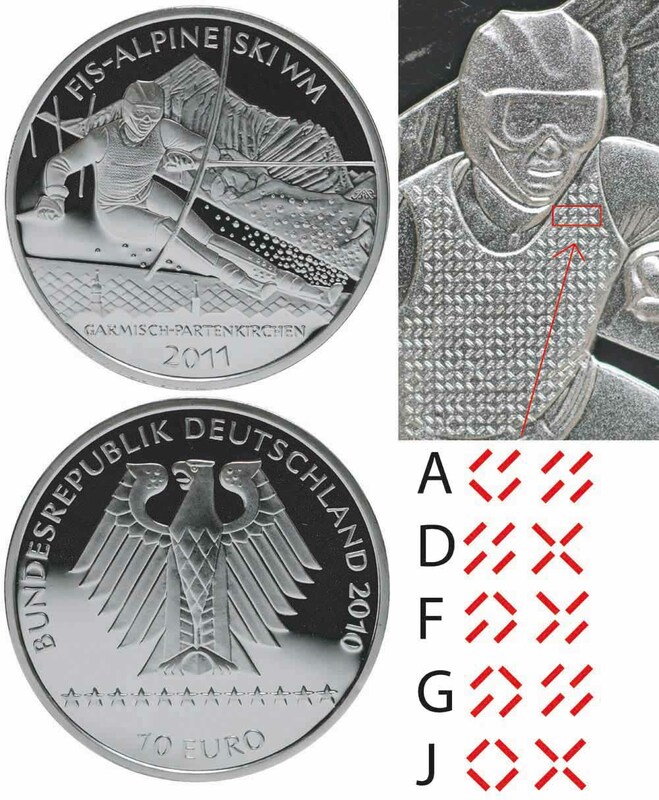 If you look at what the athlete wears, there is a certain pattern that differs slightly depending on where the coin was minted. 2011 Women's World Cup: Here it is the edge inscription again; the motto ("DIE ZUKUNFT DES FUSSBALLS IST WEIBLICH") has five S. All characters are sans-serif letters, but one S will have serifs. Is it the first one? Then the coin is from Berlin, etc. Then you should also read "The Code Girls" by Lisa Munday. It's the fascinating true story about the women who worked in cryptography during WWII in America. And of course there are many "gimmicks" too. In 2011 for example the Dutch mint made a collector coin with QR code, see here. The coin design, oh well. But the code does (as far as I can tell) not even work any more. As a WWII history buff, I enjoy things like this. I already have those coins and knew about them but it's always nice to go back and look at the coins you have, instead of perusing through new coins to acquire. Anyway, this is off-topic a bit but this post reminded me of the playing cards given to POWs by the Red Cross. They had a secret map for POWs to use and escape with. The map gets revealed when wet. The example below is a replica set, but you get the picture. phillipaanderson, JPeace$, Railguy and 2 others like this. Thanks! I was thinking of such control marks on Medieval coins. It is one thing to have your name on the front page of a scandal, but another to have your hands cut off or your eyes put out, so, Mint control marks were important to everyone. I have placed several reviews of Marshall Faintich's Astronomical Symbols on Ancient and Medieval Coins. I think that some of the stars, etc., were intended as controls. See the paper by Joan Clarke Murray that I referenced at the top. She used Gothic versus Roman lettering, three-lis and five-lis crowns, and other differences to sequence the groats and unicorns. At root, perhaps some or all of these are just random variations in craftsmanship, but I think not. The fact that they lent themselves to decoding by a cryptographer indicates that some to many if not all were intentional.